According to The Oxford Handbook of Medical Ethnomusicology (Koen, ed.) the burgeoning field of Medical Ethnomusicology is doing what many in Medical Anthropology have neglected to do for some time, which is to place music within the cultural context of healing and curative treatments. As Dr. Judah Cohen stated in his lecture, the problem is that anthropologists just do not know what to do with music; they have left it up to ethnomusicologists to decipher how music and healing relate to the culture of the patient, and how this facilitates health and healing (Cohen, lecture, 3-20-12). “A new field of integrative research and applied practice that explores holistically the roles of music and sound phenomena and related praxes in any cultural and clinical context of health and healing.”(Koen, ed., p4). Jean During is a French ethnomusicologist who has done extensive work in Central Asia and Kurdistan on music, spirituality, and healing, and has contributed the article “Therapeutic Dimensions of Music in Islamic Culture” to the Oxford Handbook of Medical Ethnomusicology (Koen, ed., p 373). In this article he discusses patient communication feedback after musical healing sessions, the historical role of how music has facilitated music, the scientific research that has been done on music and healing, and ethnomusicology has been dealing with the subject. His focus is on the power and authority that music has vested within a culture, and how that facilitates health and healing. It is precisely this angle of the power of music over the listener that During investigates as a possible source of the healing effect of music on the listener. The second half of his article deals with a case study of the Baluchi tribe in Baluchistan, a province in Iran. The key component of ethnographic research is participant observation, and asking your informants how they feel and think about the music. Jean During presented the experiences of the several “patients” (for lack of a better word) of musical healing in Central Asia. These were with musicians that he was studying in several areas, but primarily Baluchistan and Kurdistan. All of these examples of experiences of the effects of music and healing were directly with the musician and the “patient”, and the context was personal; only musical instruments were used, and no singing. During attests that it is not the mere sound quality that is producing the effect of healing on the “patients”, but rather a combination of factors that rely upon context and cultural meaning, which the individual constructs himself, as there are multiple emic perspectives. The Western myths that During mentions to demonstrate how the Western perspective has always leaned towards believing that just the sound quality itself has the healing properties are from Pythagoras and Guerjieff (During, p 366-7). During then gives examples of how science has tried to do research on the effects of music and healing. He cites one study done in 1970’s by Joel Sternheimer in which he demonstrated and evaluated the effects of musical sound from instruments, including the human voice, on plants to see how it affected their photosynthesis, which in turn affected their growth (During, p368-9). While his findings were valid, they did not necessarily transfer over to humans as well, as the vibrations on the quantum level that make certain biological responses happen in plants cannot necessarily correspond to notes on a scale. Therefore, his research was not used to elicite certain biological responses in human patients to see if the same effects happened. According to During, even though hard science did not see the validity of Sternheimer’s research, ethnomusicology took note, as the practices and experiences of ethnography have countless reports of the positive effects of harmonious music on people and situations, and the negative effects of dissonant or inharmonious music (p370). Also, sympathetic magic reports of music being used for things such as making rain are abound in tales from the field. While ethnomusicology does not serve the purpose of explaining “how” these phenomena happen, they certainly document it and ask “why”, and discuss the context and conditions for such phenomena. I would like to inject my own personal opinion at this time, and state that it would behoove ethnomusicology to research the burgeoning field of Psychoneuroimmunology, or PNI, as they research the “molecules of emotion”, and how healing is facilitated by subtle sources, such as music. As this handbook was published in 2008, all of these articles are current and relevant with today’s research, and PNI has been researched for the last thirty years. I also wrote an article published in a dance journal about PNI and how I saw a student heal from a stroke after starting dance classes. In my own experience as a dance instructor I have seen that healing happens with music both because of the quality of the pure sound that produces a certain frequency that unlocks cellular patterns, but also because it works on our emotional body when we are stimulated with music that brings back memories to us, and ties us to certain cultures, families, and individuals. During states that the therapeutic power of music is transferred through culture as the conduit (p372). The central links between healing and culture are emotion, and perception of meaning to the individual. Therefore, During uses his ethnographic research in the areas of Central Asia and Iran to base his discussion of how the Ancients viewed healing, emotion, and the vehicles of how to get there. Trance, which is an altered state of consciousness achieved by a repetitive pattern, is one conduit that is common for healing with music in these regions. Also, usage of text, melody and rhythm as sympathetic healers (like attracts like) are common. Balancing the “humors” is the aim of these kinds of therapies, such as hot, dry, cold, etc. The process is that the music arouses certain humors that balance out the patient (p373). They believe that it is not the music itself that does the healing, but rather a spirit that acts through the music, as in possession. Ritualizing these practices are common in Central Asia, such as in Classical Sufism that employs the zikhr, or chanting of the 99 names of Allah, or the dance of the whirling dervishes done by the Mevlevi sect of Sufism in Konya, Turkey. This has historically been done in secret societies, which evolved into Sufi sects after Islam came to the region, and now done in modern Sufi sects. There is no question that the power of music has the ability to produce conditions conducive to healing. Whether the music is actually doing the healing, or the patient believes that the healing is taking place, are where the participational discrepancies lie. In hard science they call this the “placebo effect”, and During gives a few examples of where his informants gave him information that times were different today, and healers are only after money, and that no one believe in these ancient practices anymore. He has demonstrated that the power of music lies within the phenomenological understanding of the individual, and their relationship with the healer, the music, and the culture within which the healing session is taking place. I now would like to focus on During’s ethnography of Ostad Elahi, The Spirit of Sounds, a famed thinker, judge and musician from Kurdistan. Elahi is a Master musician, and while he was not a performer by trade, he performed his music for his family for healing purposes. His interviews with Elahi were unfortunately cut short by his death in 1974. Elahi described a “science of the soul” in which perfection of the lived experience of life was the ultimate goal; music was a means to the perfection. The tanbur was the instrument that Elahi played, and it is a long-necked fretted lute from Kurdistan and Iran, possibly dating back to Sumeria, as it is a word that describes several varieties of the same style of instrument, and venerated as a sacred instrument (During, p4). Much like a biography, During discusses the life of Elahi and his music-making within the context of healing, however his ethnographic focus puts the understanding of the music and healing in the forefront, and he asks deeper questions about healing and cultural relevancy than is in his article mentioned previously on the therapeutic effects of music. There were many facets to Elahi’s life, as he was a reknowned thinker, and also worked as a judge. His asceticism in a Sufi sect for twelve years combined with his judicial skills made for a prudent philosopher who mindfully executed his music only for special circumstances, such as for family members when they fell ill.
During discusses at length the qualities of music that produce healing in this culture, and the differences between secular and sacred sound. The functions and purposes of the art music, as well as the esthetics and metaphysics of the music are revealed, as well. The short-term condition it brings to the recipient is of hal, which means “state of grace” in Arabic, and is an Islamic term pertaining to the graciousness that is given to an individual by coming near to God. The long-term psychological effects that his music has are to change or “awake the soul”, which would in turn change value systems within the individual (p115). 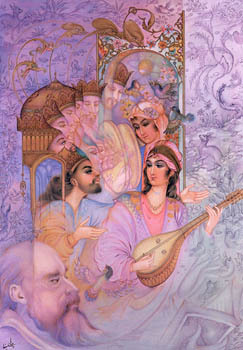 Sama, or listening, a common practice in Sufi music, is one mode that Elahi employed, as well as having his recipients clamp their mouth down on the end of the lute, so that the vibrations would penetrate right into their brain (ibid). The term that During says Elahi used was not the “effect” of the music, but rather than it was a “transference of energy” (p134). In conclusion, Medical Ethnomusicology is an exciting field that is now coming into its own, and attracting more scholars from all fields related to the discipline. Discourse between the medical fields and the social sciences is gaining ground, and there is much room for many types of discussion of music, health, healing and the nexus of culture and how the individual constructs their own vision of health. -Interactive Music Therapy in Child and Family Psychiatry. (London and Philadelphia, Jessica Kingsley Publishers, 2006). -Interactive Music Therapy-A Positive Approach: Music Therapy at a Child Development Centre. (London and Philadelphia, Jessica Kingsley Publishers, 2006). Benjamin Koen, ed., The Oxford Handbook of Medical Ethnomusicology. (New York, Oxford University Press, 2008). -“Emotion: The Gatekeeper to Performance—the Mind/Body Connection”. Video. 1999. Port Chester, NY. National Professional Resources. – Molecules of Emotion: The Science Behind Mind-Body Medicine. (New York, NY. Touchstone Publishers, Simon and Schuster. 1997). Psychoneuroimmunology, 2nd Ed. New York, NY. Academic Press, Inc.
-“Therapeutic Dimensions of Music in Islamic Culture”. The Oxford Handbook of Medical Ethnomusicology. (New York, Oxford University Press, 2008). John Ortiz. The Tao of Music, Sound Psychology: Using Music to Change Your Life. (Maine, Samuel Wiser Publishing Inc., 1997). Rabin, Bruce S. Stress, Immune Function, and Health: The Connection. (New York, NY. John Wiley & Sons, Inc., 1999). Persian music by Dr. Jean During and Dr. Lloyd Miller – YouTube. http://www.youtube.com/watch?v=FY-aJCt2yRA, last accessed April 7, 2012. The Life & Work of Ostad Elahi – Part 8 – YouTube. http://www.youtube.com/watch?v=LiLqPdQlUrc., last accessed April 7, 2012. The Art of Tanbour Part I : Exploring the Music of Ostad Elahi (1895-1974) – YouTube, http://www.youtube.com/watch?v=AxCB923_QOY&feature=related, last accessed April 7, 2012.